PERFORMATIVE POTENTIALS FOR ECO CITY BUILDING The South of Market Area, between 2nd and 6th, Mission and Townsend, provide the parameters for the investigation of the definition Eco District. Four key principles guide the exploration: the concept of urban form being guided by the performance of environmental elements such as wind, solar, and water; the efficient and sensitive use of land regarding density vertically and horizontally as well as the ratio of open space per block; the creation of cyclical environments which create energy and reuse of waste in loop systems; and a consciousness for a way of living strategically as we move forward. 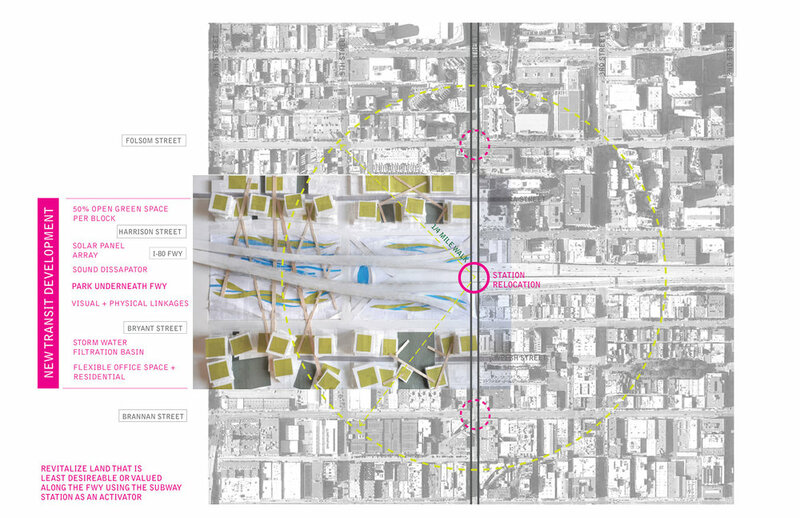 RECONFIGURING THE SOMA SUPER BLOCK If we consider recycling and reuse, one way to create an Eco District is to begin to re-conceptualize and redefine how we consider the urban block. The SOMA Super Block, on average 850’ long by 550’ wide, results in very long and deep blocks with minor streets and alleyway subdivisions as well as much larger parcels and buildings. 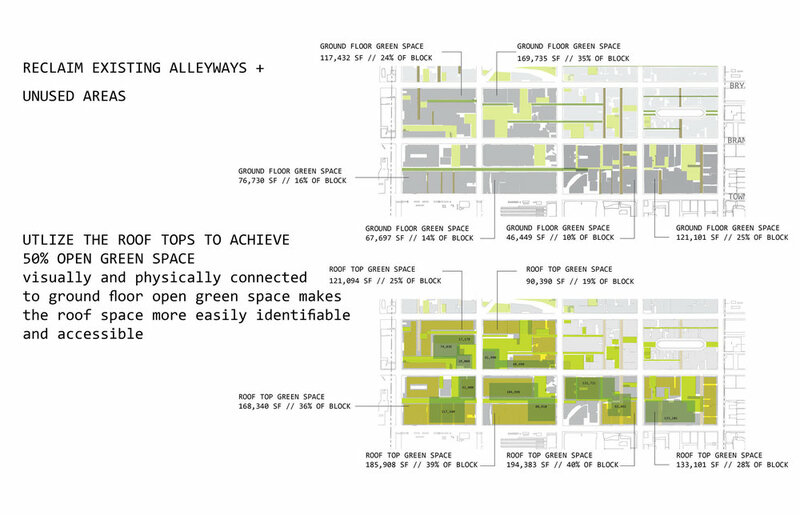 If we reconsider the block as a network rather than individual parcels, the vacant lots, minor streets, alleyways, and roof tops begin to work as a cohesive whole to support the block itself in terms of energy production, waste, recycling, storm water capture and filtration, and open space. This micro scale loop system applied to the district level may then create an environment in which the district itself acts as a sustainable network. Starting with the block, the north/south gaps and alleys could be closed to traffic while the east/west minor streets allow light traffic through but are mostly pedestrianized through paving and connective green space. The paving and green space connect block to block creating a sense of a sub network occurring in the midst of the super block structure. Where there is a vacant parcel or alleyway, these spaces would be transformed into green space which activates the roof top. Visible and easily accessible from the ground floor, the roofs then become opportunities for additional green open space. The vertical walls which connect ground to roof serve as visual and physical connectors and collectors for energy, storm water, and filtration. 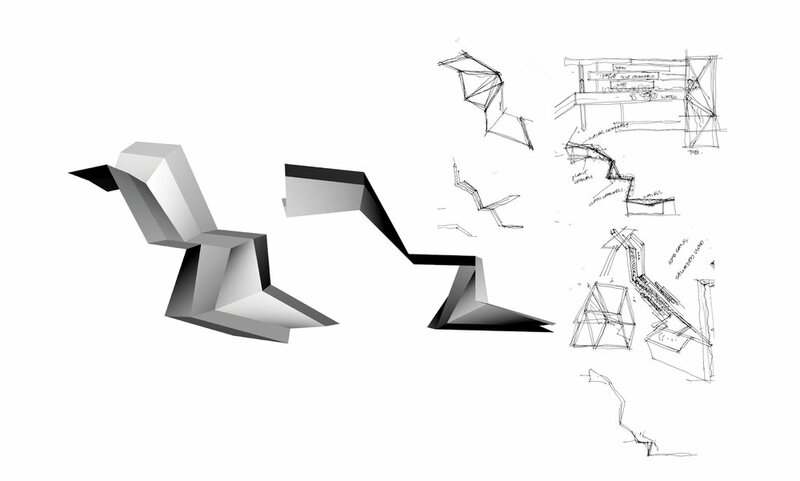 An armature applied to the many blank non-descript warehouse walls and roofs begin to take over creating a greenscape of for energy production, water collection and conveyance, water filtration, and open green space within the block giving it new form and identity. THE ECO LOOP The current urban form and character of the area has evolved into many layers from civic uses, Victorian buildings, small and large warehouse buildings, and new construction. The I-80 freeway creates a definite strong division north/south. With the introduction of a new mass transit line running along 4th Street, these new stations become activators for new development which help bridge and break this divide. Typically, as lands around freeways are the least desirable, this proposal relocates the station to the crux of the problem and transforms this divide into a solution rather- the new station located at the junction of 4th and I-80 freeway. This would activate lands westward along the I-80. At the heart of the design is a new park which reclaims the land underneath the I-80 currently used as surface parking. This park is lined with new development which increases the visual identity and importance of the area. 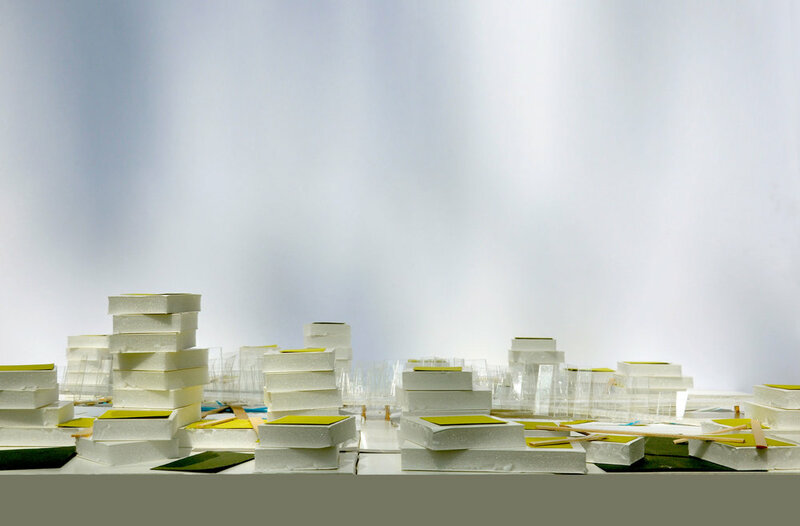 The location of the new towers offer glimpses through the super block making it permeable to light, air, and view. The new buildings mix with the existing through common open space and pedestrianized alleyways. The Park also serves as a storm water collection and filtration basin as well as a water feature and for passive recreation. 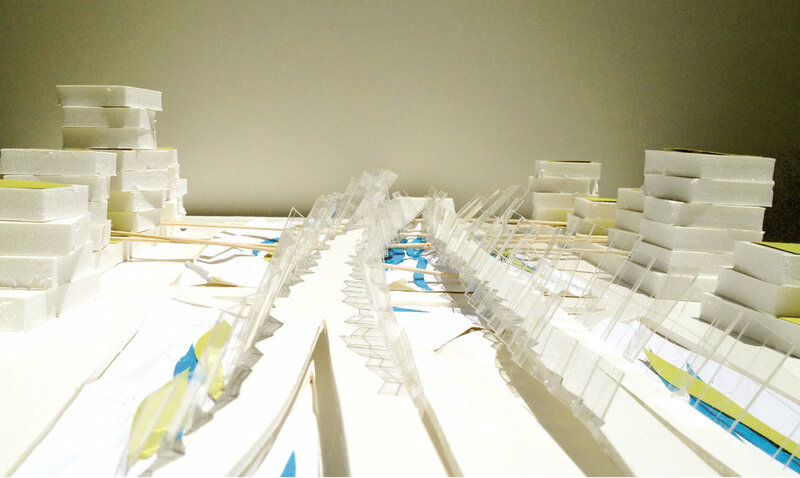 Faceted solar panels which fracture sound upward from the freeway are angled towards the west to capture maximum solar exposure and also act like water scuppers which direct storm water towards the park basins below. Energy and storm water collected supplies the adjacent R+D office spaces and residential units with renewable resources. Criss crossing pedestrian pathways connect the three blocks through bridges, paving, and open space on the ground as well as on roof tops. 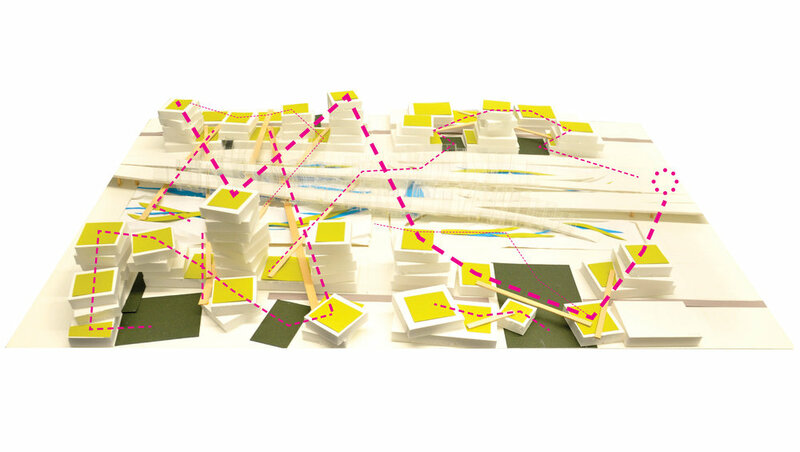 Collectively, these elements comprise of the loop systems which make an Eco District. MULTIFUNCTIONAL PERMUTATIONS What does a multi-functional network look like? 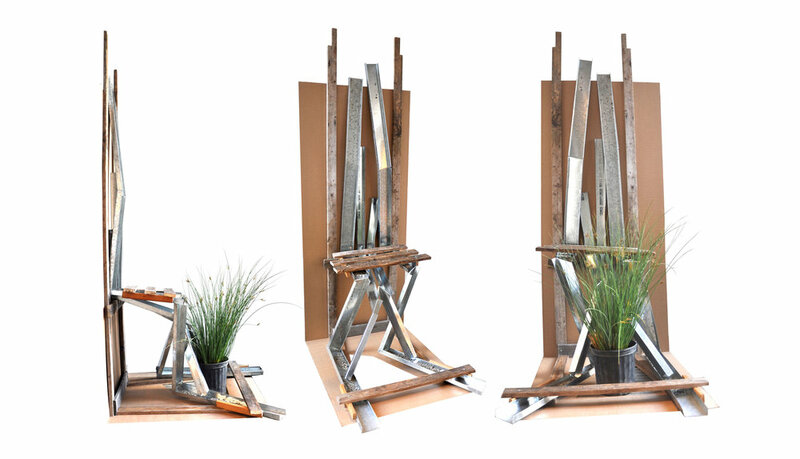 Building upon the concept of creating an armature for existing buildings and green space within the urban block, the built design detail explores the potential for the reuse of found salvaged building materials into a multifunctional structure for greening the block. Steel studs serve as a structural framework for solar panels, water conveyance, seating, and flooring and planters. The studs are crimped and bent to become channels for water conveyance which deposit water to filtration planters. The steel channels also provide support for a seating bench and standing platform. Reclaimed wood is arranged as slats with a separate frame which allows removal for easy access to the water channels below. One sits and stands above the water collected and conveyed. The piece raises our ecological consciousness and promotes environmental stewardship by exposing ecological processes at work.